David John MacGibbon was born on 13 May 1934 in Brisbane, Queensland, son of Frederick William MacGibbon, cane grower and accountant, and his wife Eva Nicholson, née Ewart. He was educated at Maryborough High School and the University of Queensland, where he graduated as a Bachelor of Dental Science, winning the Carlisle C Bastian Prize and the Mary Moffatt Memorial Prize in 1956. MacGibbon became a fellow in dental surgery of the Royal College of Surgeons, England, in 1962, and an inaugural fellow of the Royal Australasian College of Dental Surgeons in 1965. He completed postgraduate studies at the University of London, and pursued a career as a specialist in fixed prosthodontics, including appointments at the University of London and University of Michigan (1971–72). At the time of his election to the Senate, MacGibbon was senior lecturer in restorative dentistry at the University of Queensland. On 9 August 1958 he married Pamela Beak; the couple would have two daughters and two sons. MacGibbon joined the Liberal Party in 1966, serving on the Ryan area executive from 1973 to 1978, including as chairman in 1976 and 1977. He was a member of the Queensland State Executive in 1976 and 1977, and in 1982 and 1983. Preselected in third place for the Liberal Senate ticket at the general election held on 10 December 1977, MacGibbon won the final Queensland seat, and was sworn in the Senate on 15 August 1978. 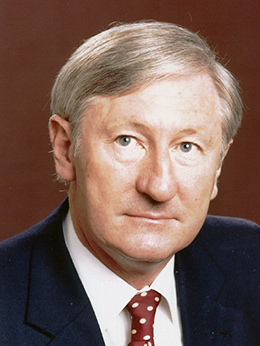 Re-elected in 1983, he headed the Queensland Liberal ticket at the elections of 1984, 1987 and 1993. Making his first speech in the Senate, on 22 November 1978, MacGibbon emphasised the burden of high tariffs placed on 'the outlying States'—Queensland, Western Australia and Tasmania—and suggested that some manufacturing industries 'should be exposed to competition', provided that they were not 'essential for defence'. He believed that reducing unemployment and establishing new industries required lower taxes and an increase in industrial research and development. He also argued that defence spending was inadequate. MacGibbon believed that 'over and above everything else, the defence of the nation is the primary responsibility of the government of the day'. From his early years, he was acutely aware of this subject. His father, awarded the Military Cross when serving on the Western Front in the First World War, also enlisted for service in the Second World War. MacGibbon had clear childhood memories of Australia at war, including hearing of the bombing of Darwin, and of the nation's 'state of utter unpreparedness': 'Thousands of Australian 18-year olds, hopelessly under-trained in emergency conditions, with obsolete weapons were sent to the front line' and 'lost their lives'. Those memories left an indelible imprint on him. Whether his party was in government or opposition, MacGibbon took advantage of every opportunity to comment on defence and national security issues. Speaking in 1989, he listed the 'wide range' of defence topics which he had addressed since entering the Senate: recruitment, training, equipment, conditions of service, morale, 'and the command and control of the Australian defence forces to the whole strategic concept as to how they have been employed'. Five years earlier, he remarked: 'I think that I have spoken more on that subject [defence] than any other honourable senator'. While critical on occasions of procedures in the Department of Defence for the acquisition of matériel, he never wavered in his admiration for the professionalism of the personnel of the armed services. In 1981 MacGibbon declared: 'I do not see defence in terms of party politics', and he reiterated the point in 1982, urging bipartisanship in the chamber when defence was discussed— though this was sometimes difficult to achieve in practice. In 1984 he noted that 'when I have spoken [on defence] I have usually provoked the intolerance of the Labor Party', and he could respond in kind, accusing Labor governments from Curtin to Hawke of failing to plan adequately for the defence of Australia. But by the end of his Senate career MacGibbon's expertise in, and commitment to, the betterment of defence capabilities and professional standards was widely acknowledged across party lines. According to Labor Senator Chris Schacht, MacGibbon was 'one of the few members of the parliament who had a genuine interest in defence', and 'his technical knowledge was second to none'. In 1978 MacGibbon told the Senate that Australia was 'no longer ... in the favoured position of having allies who automatically will come to our aid. The defence of this country is the responsibility of the Australian people'—who 'do not place much emphasis on it'. In the following year he stated that the 'biggest problems we face in providing this defence is that people either believe that it is beyond us or that there is simply no threat'. According to MacGibbon, neither argument was true: 'We can defend this country'. He suggested, then and later, that Australia should design 'our own weapons systems', specifically for Australian conditions. Self-reliance would, however, require a change in financial priorities and MacGibbon argued consistently for a higher budget allocation for defence. MacGibbon, a qualified pilot, was also intensely interested in aviation policy. In the Senate he discussed the operations of the Civil Aviation Authority, air safety and accident investigation, domestic air fares, coastal surveillance, and the requirements of defence aircraft, including the importance of acquiring aircraft with an airborne early warning control system. A long-term advocate of the development of a new airport for Brisbane, he also argued that Townsville should become an international airport, which it did from 1980. From time to time MacGibbon was at odds with party policy. In May 1980, together with three other Liberal senators, he voted for an amendment referring the Fraser Government's Broadcasting and Television Amendment Bill to a standing committee, for an inquiry into the proposal to establish an independent multicultural broadcasting corporation. The amendment was carried by one vote. Five years later, with multicultural television established through the Special Broadcasting Service (SBS), MacGibbon found no public support among colleagues for his call that SBS be disbanded as an extravagant waste of taxpayers' money. In December 1981 MacGibbon criticised the Fraser Government's 'hurried decision' to buy the aircraft carrier HMS Invincible as a replacement for HMAS Melbourne. Three months later, MacGibbon and another government senator, David Hamer spoke in support of a motion for the Joint Committee on Foreign Affairs and Defence to inquire into the relevance of an aircraft carrier to Australia's strategic purposes. Against the government's wishes, the motion was carried on the voices, with the support of Labor and the Democrats. Late in 1982 MacGibbon joined nine other Coalition senators in crossing the floor over the retrospective provisions of the Taxation (Unpaid Company Tax) Assessment Bill; MacGibbon argued that retrospective legislation 'undermines the very basis of the rule of law' and 'is specifically against the philosophy of the Liberal Party'. He maintained that the problem of tax evasion would not be solved until the Tax Act was simplified. The bill passed despite this, with Labor support (42–13). On 5 May 1987 MacGibbon was one of seven Liberal senators who crossed the floor to vote for the third reading of the Hawke Labor Government's Equal Employment Opportunity (Commonwealth Authorities) Bill. From May 1989 until April 1990 MacGibbon was shadow minister for customs under Andrew Peacock. He returned to the shadow ministry in the last year of John Hewson's leadership, holding the portfolios of defence science and personnel, as well as veterans' affairs, from April 1993 to May 1994. In his shadow posts MacGibbon sought the views of service personnel first-hand, visiting troops stationed at bases around Australia or deployed overseas on peacekeeping missions, including Cambodia and Somalia. In April 1993, in his capacity as veterans' affairs spokesman, MacGibbon joined an Australian delegation, including fourteen First World War veterans, travelling to France and Belgium to commemorate the 75th anniversary of the battles on the Western Front. He later told the Senate that the journey was 'the experience of a lifetime'. In 1983 MacGibbon was appointed to the Joint Standing Committee on Foreign Affairs and Defence, and remained a member of this committee (which expanded to become the Joint Standing Committee on Foreign Affairs, Defence and Trade in 1987) for the greater part of the next sixteen years until he left the Senate. As chairman of the committee (March 1998–June 1999), and of the Defence sub-committee (1996–99), he guided the committee through major inquiries into the funding of defence, the military justice system, and the loss of HMAS Sydney in 1941. MacGibbon took a particular interest in the resolution of the bloody conflict between Papua New Guinea and the separatist movement in Bougainville, which had begun in 1988. In a private capacity, he met the Bougainville rebel leaders at Honiara, in the Solomon Islands, in June 1997, in order to encourage their participation in peace talks. Several months later, a lasting truce came into effect. In March 1999 MacGibbon led a delegation of committee members to Bougainville, to report on progress towards peace. MacGibbon held considered views on the shortcomings of the electoral system, and the way in which Parliament operated, and he was prepared to suggest reforms. Following the 1996 election, when the newly-elected Howard Government failed to secure a majority in the Senate, he proposed the introduction of an electoral threshold, to prevent minor party candidates with less than 11.42 per cent of the primary vote (80 per cent of a quota) gaining election to the Senate. The idea had been in MacGibbon's mind since the 1977 election, when Australian Democrats senators were first elected. In his opinion, 'the democratic process is to give the people the right to elect a government of their choice, not to have that government paralysed and unable to act'. Speaking in 1982 MacGibbon observed that while the Senate committee system was 'the only place, really, where informed debate can take place in any detail', it could be reformed and modified. He went on to suggest that the Senate Foreign Affairs and Defence Committee should be split up, with one committee dealing with foreign affairs and the other focusing on defence. By 1999, rather than proposing additional committees, MacGibbon concluded that the committee system 'has been expanded ... beyond a sustainable level' and that the number of committees needed to be rationalised. The great virtue of parliamentary committees was their provision 'through their public hearings and subsequent reports' of 'a very good and very important human link between what is often seen as an impersonal and remote Parliament and the people'. He considered the work of Senate estimates committees in dissecting appropriation bills to be 'a very essential part' of the process of accountability. Writing at the end of his Senate career, MacGibbon envisaged the Senate committee system 'continuing to develop as one of the few alternatives to governmental hegemony', subject to the considerable restraints of the time available to senators and adequate funding. the pressures from the volume of legislation and its complexity, combined with the inherent adversarial nature of the party system, make the opportunities for meaningful debate [... ] in either the Senate or the House of Representatives very difficult. The more thoughtful members of Parliament realise that this battle over accountability is the real battle, not the public one with their opposing political party. MacGibbon believed that parliamentary accountability should apply to all government agencies, including the intelligence services. He pointed out frequently that Australia was almost alone among democracies in having 'effectively no oversight at all' of its several intelligence agencies, and argued that parliamentary scrutiny of the agencies could be managed without compromising operational security. MacGibbon was appointed to the Joint Statutory Committee on the Australian Security Intelligence Organisation in 1990, but resigned within twelve months, 'as it was perfectly clear, after a while, that continued service was pointless'. After the Coalition victory at the 1996 election MacGibbon rejoined the committee, serving as presiding member from 1996 to 1998. In July 1997 he submitted a proposal for parliamentary scrutiny of intelligence agencies to Prime Minister Howard, although no action resulted. MacGibbon's advocacy of scrutiny of intelligence services continued after he left Parliament, and in July 2001 he appeared as a witness before the Joint Select Committee on Intelligence Services. In March 1998 factionalism within the Queensland Liberal Party resulted in MacGibbon being dropped to the unwinnable third position on the party Senate ticket, behind Warwick Parer and Brett Mason. The preselection ballot was close, and five months later MacGibbon was reported to be ready to take legal action, but this did not eventuate. He was defeated at the election held in October 1998, and his Senate term expired in June 1999. After leaving the Senate, MacGibbon immersed himself in the family's beef cattle grazing interests in Central Queensland. He retained his commitment to defence, and early in 2000 he led a working group of the Defence and Industry Advisory Council, focusing on ways in which the procurement processes of the Defence Department could be improved. In June 2000 he was appointed to a four-person community consultation team, established by the Defence Department to travel across the country seeking public input into the development of a White Paper, Defence Review 2000—Our Future Defence Force. MacGibbon was also a member of the Commonwealth Observer Group witnessing parliamentary elections in Zimbabwe in 2000, and local government elections in Lesotho in 2002. His interest in Australian military history was undiminished, and in 2005, aged seventy-one, he participated in an eight-day trek on the Kokoda Trail. In valedictory speeches given in June 1999 a number of senators from all sides of the chamber spoke of MacGibbon's contributions to discussions of defence and aviation, in debates and in his committee work. Some also noted his work for peace in Bougainville, while Senator Eggleston (Lib., WA) said that MacGibbon had 'brought a great deal of grace and dignity to the Senate'. Senator O'Chee believed that MacGibbon had always been a steadying influence, sometimes in rocky days, for the Coalition. Senator Hill (SA), the Leader of the Government in the Senate, observed that MacGibbon had been 'a touch unlucky in his political career'. This comment was taken up by Labor's Senate Leader, John Faulkner, who noted that MacGibbon 'found himself in opposition for 13 years at a time when obviously, if the coalition had been in government, he almost certainly would have served as a minister'. CPD, 22 Nov. 1978, pp. 2393–7, 22 Oct. 1981, p. 1611, 29 March 1984, pp. 915–18. CPD, 8 June 1989, p. 3681, 29 March 1984, pp. 915–18, 22 Oct. 1981, p. 1614, 6 May 1982, pp. 1920–1, 29 March 1984, p. 916, 24 June 1999, pp. 6390–434, 22 Nov. 1978, p. 2396, 8 June 1979, pp. 2970–2, 24 May 1983, p. 754. Transcript, ABC Radio, 'AM', 11 June 1985; Australian (Syd. ), 11 June 1985, p. 3, 12 June 1985, p. 3; CPD, 19 Nov. 1982, pp. 2627–8, 28 Sept. 1993, p. 1327, Courier Mail (Brisb. ), 26 June 1997, p. 12; Joint Standing Committee on Foreign Affairs, Defence and Trade, Interim Report: Visit to Bougainville, 15–18 March 1999, Canberra, 1999. Courier-Mail (Brisb. ), 23 Sept. 1996, p. 4; CPD, 6 May 1982, p. 1921, 30 June 1999, pp. 6854–7 ; David MacGibbon, 'The Future of the Committee System' and 'Witnesses' in Parliamentary Committees: Enhancing Democratic Governance, Gordon Barnhart (ed. ), Cavendish, London, 1999, pp. 100, 119, 124; David MacGibbon, 'Defence and the Parliament: Address to the Royal United Service Institute of New South Wales', 28 July 1998; Age (Melb. ), 26 Sept. 1997, p. 1 (A2); AFR (Syd. ), 25 July 1997, p. 5. Age (Melb. ), 24 Aug. 1998, p. A2; Courier-Mail (Brisb. ), 7 Aug. 1998, p. 2; CPD, 24 June 1999, pp. 6426, 6434, 6391, 6393.